As we sit here in the airport in Halifax after a week-long visit to Sydney, Cape Breton, we consider ourselves so fortunate to have met so many warm welcoming and enthusiastic people. This trip launched the National Trust for Canada into a “Main Street” regeneration project for Sydney’s downtown in partnership with the Cape Breton Regional Municipality (CBRM) and the Sydney Waterfront District Association. All smiles for the National Trust and Sydney Waterfront District regeneration team following the successful soft launch and open house for the downtown Sydney regeneration project. It all began at the National Trust’s 2014 conference in Charlottetown with CBRM’s “downtown” ward Councillor Eldon MacDonald attending the Main Street workshop. Eldon saw possibilities for the Trust’s trademarked Main Street Approach being applicable to his community, to fill vacancies, improve the image and “brand” of the downtown, encourage new businesses and housing, and enhance the experience of the Sydney Waterfront District for cruise ship passengers who often pass through Sydney en route to famed Cabot Trail. Eldon became the local champion for this project and engaged with key local leaders including CBRM staff, Mayor, and Council, the Sydney Waterfront District Association, and community organizations. Together, they identified municipal funds and then secured support from the Atlantic Canada Opportunity Agency. Fast forward to May 2017: the Sydney Waterfront District Regeneration Project kicks off, with the opening of the project’s storefront office on May 26. 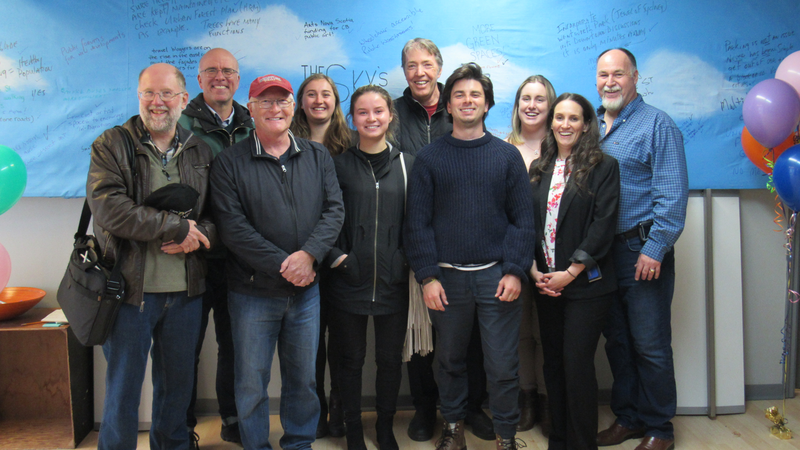 From May 24-31, our team, with Jon Linton (economic development expert from TCI Management) met with and learned a lot from CBRM staff, council members, Mayor Clarke, the Youth Council, Heritage Advisory Committee, and dozens of people at the new project “storefront office” in a former fudge factory. Everyone we connected with expressed a genuine desire to see downtown Sydney thrive, and be a desirable place to live, work, and play. Our two fantastic summer students Madison Tousaw and Edyta Suska were tasked with creating the photo documentation of about 100 buildings in the district. Taking over 1,600 photos, they collaborated with Bradley Murphy, the newly hired Regeneration Coordinator (Cape Breton born and raised, and a graduate of Carleton University’s School of Architecture). The team took note of current conditions and character-defining elements of each of the buildings. This first step of inventorying Sydney’s built heritage will help guide and inspire business owners and the community to plan and implement big and small projects that will make a difference to the health of the district. The team experienced the wealth of Sydney’s culture, including the story of the Membertou Mi’kmaq First Nation, colonial Fortress of Louisbourg, interacting with passengers from a Holland America cruise ship, to listening and singing to the lively music at a true “kitchen party” whilst taking advantage of the fresh catch of the lobster season. With our bellies full, and minds churning with the many ideas we have heard, we made our way back to Ottawa eager to build on this great beginning and the vivid memory our Sydney Cape Breton colleagues in our hearts and thoughts as they work hard to regenerate Sydney’s historic downtown waterfront district. The Downtown Sydney Regeneration Project is part of the National Trust for Canada’s Regeneration Works initiative. To learn more, click here. This is exciting all around!